Confession: I hated skiing. My brother reminded me of this embarrassing little factoid at Thanksgiving. True enough, when I was 7, 8, 9, 10, I feigned illness on ski mornings, telling my mom I had a sudden stomach ache, bug, whatever excuse to avoid the slopes. My family, you see, was passionate about skiing every single free day, every weekend, and holiday. You get the picture. I just longed to be that kid lounging in PJs, munching on Captain Crunch and watching cartoons on Saturday morning. No such luck -forced to ski – poor me. My mom was wild about the winter sport of skiing, even insisting that sick days were not for missing school, unless it was powder flu and you were playing hooky to go ski. Well, my fake flu rarely kept me from skiing, accept the rare occasion when my step mom offered refuge so I could relish the joys of indoors, tv, and a taste of the lazy life of “normal kids”. But most weekends I found solace with my ski friend Jill who shared my ski sentiments, and my love of the lodge. We shared copious cups of hot cocoa, and made our token ski runs to placate our parents. My brothers absolutely loved skiing, catching air off hand packed jumps (terrain parks weren’t even a rumor yet), bombing downhill tucks to the base, even skiing in the trees before glade skiing became the rage. Sometimes I followed them, and actually had fun, but mostly I craved the couch. Gunstock was our groove every weekend. Then at age 12, we moved to Vermont and Smugglers Notch became our new mountain. My parents had purchased a ski lodge, so weekends meant making bunk beds and kp (kitchen patrol) for the 100+ guests before we could ski. Suddenly skiing had far more appeal. We would rush to change over those bunk beds and get to the slopes. I also discovered there were more boys on the mountain than girls and as a bonus, I could keep up on the steeps of FIS and glades of the gnarly-named “back bowls.” The ski switched flipped for me. I cherished my season pass (my Mom’s annual guaranteed gift). And I prayed for new ski gear each year (Santa rarely came through since hand-me-downs from the big brothers were plentiful). Then I graduated to ski instructor in my college years and earned my own ticket to ride. My husband choice was easy – the guy who could ski as well, no- better, than me. Flash forward. Not surprisingly my daughter Aspen didn’t always love our tradition to pack up the SUV and go ski every weekend. She wished she could stay home for that school dance or friend’s birthday party. Waking up before the sun on Saturday morning for first tracks would not have been her first choice. So history repeated itself, I became my enthusiastic alpine mother, my husband and I were those persistent parents that dragged their kids skiing every weekend. Now our son teaches skiing, torch passed. Our daughter loves skiing too, on her own terms and timeline. She recently thanked me for taking her skiing weekends, even Sunrise Service at Sugarloaf, versus traditional church every Sunday. And my brother, he’s dragging his girl to the slopes this morning too. To all the passionate ski parents out there, I know your dilemma. I know well both sides of the alpine ski argument, to go or not to go. It’s far easy to cave to sleeping, in, cartoons and letting the kids veg out all weekend. 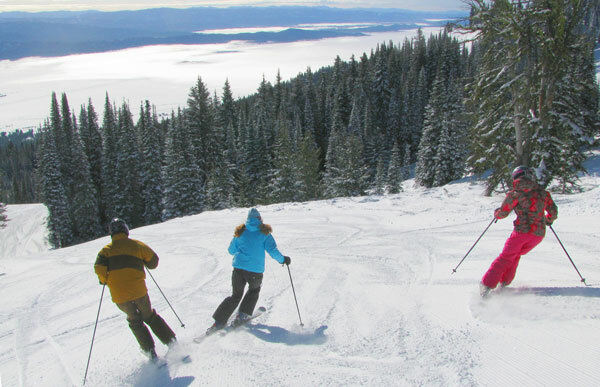 The sport of skiing is expensive, exhausting and inconvenient for ski families. And I wouldn’t trade a moment, skiing with my brothers, skiing with my parents, my husband and my kids – even skiing with my kids when they were teens. Ski often my friends.